Despite Nintendo assuring us it wouldn't sell out immediately, the SNES Classic Edition is beginning to look a lot like a repeat of the near-impossible-to-find NES Classic. 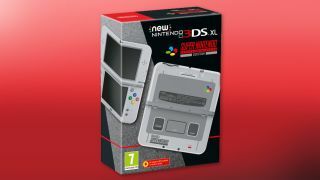 Thankfully, for those looking for another way to indulge their gaming nostalgia, Nintendo is releasing a Super Nintendo-themed New Nintendo 3DS XL in Europe on October 13. The Super Nintendo edition of the 3DS XL is mostly unchanged from last year's Japan-exclusive Super Famicom version of the handheld, save for details like the 'Super Famicom' lettering swapped out for a Super Nintendo logo. As one might guess from the distinct lack of purple on the 3DS, (the US version of the classic console featured a purple-accented design) this particular edition of the SNES-themed handheld is currently exclusive to Europe, with no plans announced yet for a US release. The New Nintendo 3DS XL – Super Nintendo Entertainment System Edition price is also a mystery, though the Super Famicom edition ran for 21,600 yen (about $190 / £150 / AU$250) in Japan, so it's possible the handheld's price could be in that realm. While Nintendo is optimistic about the newest reskin of its 3DS XL hitting store shelves in October, we still urge interested buyers to keep an eye out for preorders. If there's one thing to learn from Nintendo's nostalgic reissues, even a 3DS painted to look like an SNES could become a hassle to buy.